Golden Triangle & Tiger Express Train ( Bandhavgarh, Kanha, Jabalpur ) Offers - Golden triangle travel packages with tiger reserves trains tours to bandhavgarh, kanha and jabalpur. Online bookings is also available for this new itinerary. Totally new itinerary with golden triangle & tiger express train. As usual 6 days golden triangle is performed by car / luxury trains and main attractions of the golden triangle circuit are world heritage sites, cusine, wonder of world the Taj Mahal Agra, elephant ride at Amber fort, visit to Choki Dhani etc. 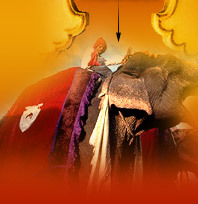 Shopping in golden triangle is unique where you can buy handicraft item, clothes, leather items, jems and jewellery etc. Tourist guide will be provide at each destinations to understand the history of great warrior. A new train start to cater wildlife circuit of Madhya Pradesh destinations which are more popular as tiger reserves are bandhavgarh, kanha & Jabalpur. 5 days / 6 nights Semi luxury train journey start every Sunday from Safdarjung Railway station in New Delhi to Katni from where you would travel to Bandhavgarh and then visit Kanha and A visit to the famous Dhuadhar Waterfall in Bhedaghat, Jabalpur is extra added attraction for tourist. This one is first semi luxury train have dinning car. 3 star hotel accommodation will be provided in Bandhavgarh and Kanha. All sightseeing and travel is made by A/C Vehicle. Wildlife safari in both bandhavgarh and Kanha will be arrange and included in prices.